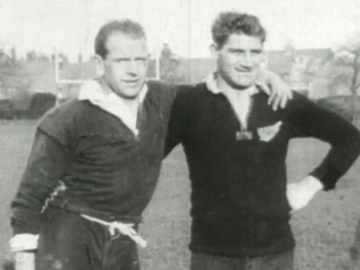 This silent 16mm gem shows two legendary All Black teams in action. The film opens with a roll-call of the returning ‘Invincibles’, who — starring fullback George Nepia — were unbeaten on their international tour of 1924/5; and then features match highlights. The second clip opens with rare footage of the 1905 ‘Originals’; before returning to packed 1925 Twickenham for a test match, where the Invincibles perform “the famous Māori War Cry”, show off the Kiwi mascot (intended as a gift for the first team to beat them), meet the Prince of Wales, and defeat England.